At the time we'd inherited another broken lawnmower that turned out to just have a split fuel line that was easily fixed. This lawnmower, whilst not perfect, pretty much started almost every time and did the job well. Nothing like the problematic, contrariness of the previous machine. After recently moving house, the inherited lawnmower stayed behind as part of a deceased estate to be passed on to the owner's son. Thus there became a need to replace it. I don't think I've ever bought myself new gardening tools beyond gardening gloves and maybe a spade. Why would I? I hate gardening. However I have learned to do gardening and take a bit of pride in doing it well - job satisfaction is my motivation. 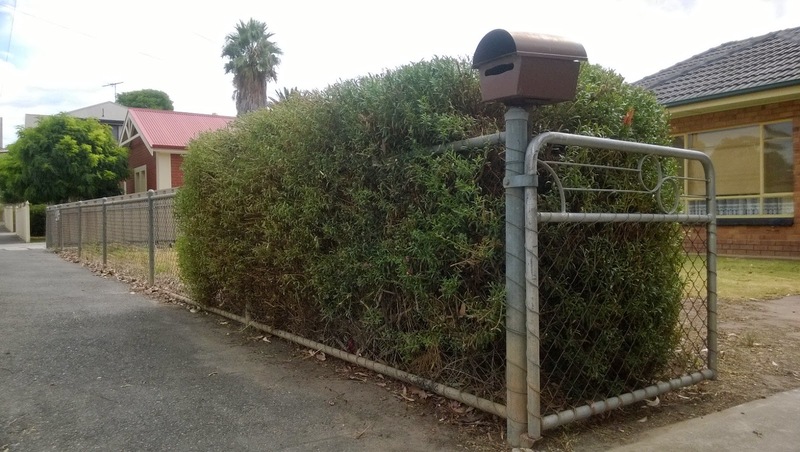 Having finally started to earn some reasonable money from animating I vowed to treat myself to a brand new lawnmower, with a catcher and throw in a hedge trimmer because the new place has a kind of hedge type bush out the front. You can see my new lawnmower and hedge trimmer in the photo above. 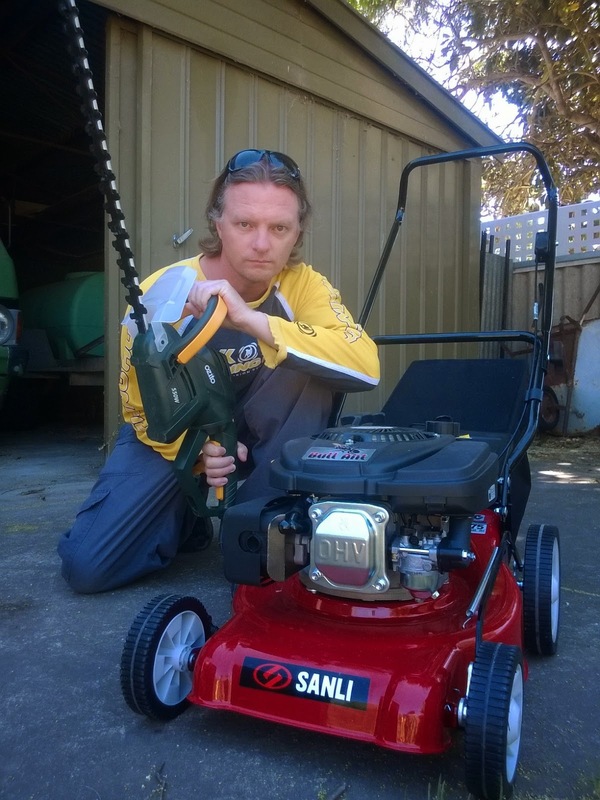 The lawnmower I haven't used yet but, being new, I'm confident this may be the only time I write about it in this blog. Unless it turns out to be so good I've just got to tell you about it (or so bad I can't help but tell you about it). We'll see. I'm trying to water some life back into the lawn first as the heat hasn't been kind to the grass. The hedge trimmer I fired up for the first time to attack a severely out of control hedge thingy next to our driveway. Having never, ever used a hedge trimmer in my entire life I was confident I could get the job done - probably - because I did take the time to read the trimmer's instruction booklet. I followed its advice to start from the bottom and work up. Enigma said she wanted me to shape the hedge like a giraffe... I reckon it looks just like one if you squint and turn your head to look at a picture of a giraffe. Okay so it's a giraffe inside a box hedge! I wish I'd thought to take a before photo because it really did look like an exploding elephant prior to starting... well... at least more elephant sized anyway. Despite not really enjoying gardening I have lots of plans for both our front and back yards so I imagine you may just get more posts about my gardening adventures in the future. I'm more like Dad about gardening... happy to maintain what's there and tidy things up if need be but I couldn't care less about plants and their names and all that kind of detail. I wouldn't be too hopeful about reading future posts about gardening. Unless something really noteworthy happens there won't be much to write about. You said that you had lots of plans though, so may write about it, or you could just put some photos on Face Book every now and again to show any progress. I find that for plants, geraniums and the daisy bushes are very colourful and do very well in just ordinary soils such as sandy soils like in Perth if you can't or don't go in for adding mulch etc. That's what I have in my courtyard with the pot plants (geraniums) and I planted them in the garden at the front, some from cuttings out of pots and others just planted straight into the garden. I think SA soil has iron ore in it as it is red. I do very well with cuttings, they always seem to take. If you get natives and low maintenance plants they more or less look after themselves except for watering and a bit of pruning or trimming with secateurs if it's a light shrub, and sometimes the slow releases at the end of the season. How's Kathy with gardening, maybe just growing plants? When your garden is colourful it's nice to sit back and enjoy it if you get to sit outside, which I don't do any of even though I've now got the table and chairs outside at the front. If you don't it's still nice to see out of your windows or when you're coming and going. Well I have lots of plans but mainly around tidying the garden up rather than anything that may look impressive. Once you get into naming plants and describing soils you lose me. I have zero interest in learning about plants beyond adding water to make them grow and keeping the garden tidy. Kathy likes buying plants and knows more about their names but she's not really into gardening either. I do like to sit out in the garden if it's got a nice atmosphere - which our current house does. Gotta try to empty off our veranda though as it looks mostly like a storage area at the moment.